Cardinal George Pell is being sued by a man who alleges he was sexually abused by the cleric in an Australian swimming pool in the 1970s. Pell has consistently denied committing abuse in a pool in Ballarat, Victoria, in the 1970s. Last week, prosecutors dropped criminal charges against him relating to that decade. He is now being sued in a civil case. In December, Pell was found guilty of sexually abusing two boys in Melbourne in 1996. He is challenging the verdict. 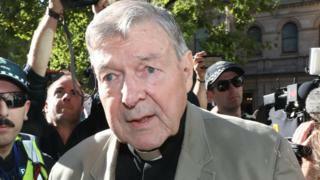 Allegations that Pell indecently assaulted boys in the 1970s had been due to be put to a second trial, but it will no longer go ahead. On Monday, lawyers for a 50-year-old man - who does not want to be identified - planned to lodge a civil lawsuit in the Supreme Court of Victoria, alleging that he was assaulted by Pell in a Ballarat pool as a boy. The man had been due to testify in the criminal trial and was "devastated" that it had collapsed, according his lawyer. "He said he felt empty and that a major injustice had occurred," said Lee Flanagan from firm Arnold Thomas & Becker. The man was a ward of the state at the time of the alleged abuse. He is also seeking compensation from Victoria's state government, his former boys' home, and the Catholic Archdiocese of Melbourne over alleged breaches of duty of care, according to a statement of claim seen by the BBC. Pell's legal team is yet to respond to the lawsuit. Last year, a criminal trial heard that Pell had abused two 13-year-old boys in a cathedral in 1996, when the cleric was archbishop of Melbourne. The jury in the trial unanimously convicted him of five charges. Pell was remanded in custody last week and is due to be sentenced on 13 March. The case has rocked the Catholic Church, where Pell was considered one of Pope Francis's closest advisers. Details of the case had been kept secret from the public until last week due to legal reasons.